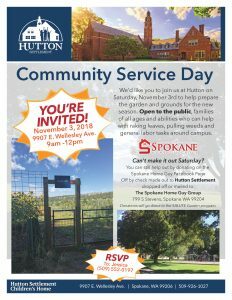 October 22nd-November 2nd 2018, The Spokane Home Guy Group in partnership with Aspen Sound, Cogo, Secured Investment Corp and the Town of Rockford will be raising money to fund the 2019 SALUTE garden for Hutton Settlement. Our goal is to raise $4,000. This garden is ran 100% by the children who are responsible for planting, caring for, and harvesting a variety of fruits and vegetables. The produce grown is used for family dinners, the culinary arts program, and is sold at farmer’s markets to raise money that funds additional programs and outings. Find out more about Hutton and these programs HERE.